Durham Police Chief Constable Mike Barton. A retiring police chief has said that one of the main challenges facing his successor and police forces across the country will be managing "vitriol from extremes" in society. Durham Police Chief Constable Mike Barton, who is set to leave his position on June 7, said that what he described as a "state of flux" has helped prompt divisiveness in the UK. Asked about the to-do list the person that fills his role will have to tackle, Mr Barton joked "tidying my office up might be the first thing", before adding: "I don't know what's going to happen to wider society. "Everybody sees the state of flux that we're in, and journalists describe more and more a 'divided kingdom'. "I don't know whether we've got a divided kingdom or not, but there definitely seems to be more divisiveness, there seems to be more vitriol from the extremes being expressed more openly in society." He added: "I think any police force and any police leader will have to be cognisant of that, and scratch their heads individually and collectively about how we actually deal with that. "It's sometimes jolly hard to negotiate with those extremes as to how we can actually live peaceably alongside each other." On the future of policing, the chief constable said that the internet will continue to stretch his and other forces. "Gone are the days where we can put a border around Durham, or a border around the UK," he said. "Pretty much every crime we investigate now involves a digital footprint, that could come from Venezuela or Serbia. So that is a big challenge." Mr Barton took up his current role in 2012, having arrived as the force's assistant chief constable in 2008. During that time, he has become known partly for his objections to the prohibition of Class A drugs, saying that pushing for a "grown-up debate" around the issue would also be one of his proudest legacies. He said: "In 10, 15 or 20 years time, we're going to look on this generation of the prohibition of Class A drugs, and we're going to think that it's crackers." 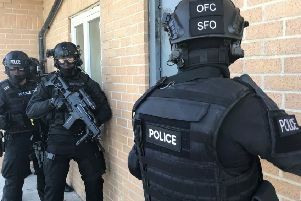 The outgoing chief also helped to launch the force's Checkpoint scheme, which aims "to stop the revolving door of justice" by attempting to change the behaviour of some offenders who commit minor offences by signing them up to a four-month course, rather than prosecute them. Mr Barton said that such a system of restorative justice has helped reduce re-offending on his patch, saying that the scheme has been taken up "with alacrity and quite some vigour by other police forces". He concluded: "My proudest legacy I think is that I've left some really inspiring and inspired people behind, in Durham and elsewhere, who are now doing things differently."